Want to extend your life by 10 years? Run a marathon. In the last 10km, time slows to the point where it feels as though 10 years have passed. Hey, I didn't say they'd be good years! Settled into a comfortable pace, kept my heart rate low. Felt good up to about 30km. Last 10km still smoked me. Realized I couldn't hold my target pace, backed off, then backed way off... held on to at least break 3:40 and set a new personal best (previous was 3:44+). Heat may have been a small factor, certainly felt it in the closing kilometers as we were in full sun and temps were up to 20C. But ultimately I think the bigger factor is still weight... 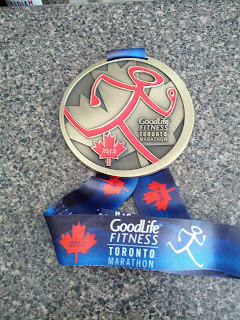 I don't think I can pull off a 3:35 without dropping some pounds, as I really trained hard and by the book for this one. Not much more to do on that front, without quitting my day job! I really noticed the rest of the crowd slowed down with me... my pace went off by 30-40s per kilometer, yet not that many people were passing me, and surprisingly I was still passing other people! I've read before that the vast majority of marathon runners fade at the end. There seems to be the assumption that they didn't pace it right, but I think if you can't put in mega mileage then you can pretty much expect the heart rate to creep higher and the muscles to stop doing what you're telling them in those last few kilometers. Maybe it'll be different for me at a lower weight, we'll see! I'll have to try it.